THE BATTLE IN WISCONSIN: A TONE-SETTER FOR 2012? In recent elections, it also has been the country's political epicenter, a collection of battleground states from Pennsylvania west to Wisconsin that can readily swing from one party to the other. But the spotlight these days is on the western terminus of this vote-rich sector, the state of Wisconsin, where a high-stakes, political battle is raging that could significantly affect the backdrop of the 2012 campaign. On one side, the newly elected Republican governor, Scott Walker, is aggressively seeking to balance the state's budget by reducing benefits for tens of thousands of state employees and curbing their union-based collective bargaining rights. On the other side, aggrieved workers and the public employee unions are protesting, while their Democratic allies in the Wisconsin Senate have left the state to at least temporarily prevent the Republican-controlled legislature from acting. Walker's critics denounce him as a union buster. The governor claims he is a budget balancer. But it is clear that in targeting collective bargaining rights, he has willingly thrown down the gauntlet in a way that has ramifications far beyond Wisconsin. Newly empowered Republican governors and legislatures elsewhere are closely watching the action. So are the beleaguered labor movement and its allies in the Democratic Party. For at risk is the health of some of the party's most valuable friends, the public employees unions. Democrats lean on them heavily for financial support and political manpower, both in Wisconsin and nationally. That all this is taking place in Wisconsin, long a laboratory for social reform - including collective bargaining rights for state workers - adds weight to the situation. A roll back of those rights in Wisconsin would be akin to Republican Scott Brown's upset Senate victory last January in Democratic Massachusetts – a shout out to the nation that if it could happen there, it could happen anywhere. No section of the country has been more of a battleground in recent presidential elections than the industrial Rust Belt, a swath of states from Pennsylvania west to Wisconsin. The half dozen states in this sector will offer a combined total of 95 electoral votes in 2012, down five from the 2008 presidential election. Yet they are still a compelling prize. Virtually all are quintessential swing states, as shown by the sharp difference between the pro-Democratic presidential vote in 2008 and the pro-Republican gubernatorial results in 2010. Barack Obama swept all six of these Rust Belt states in the last presidential election, most by large margins. But Republicans picked up governorships in four of them last fall (losing Illinois narrowly). The GOP already held the governorship in Indiana, which is contested in presidential election years. Note: Vote percentages are based on the total vote. Sources: America Votes 28 (CQ Press) for the 2008 presidential vote by state; state election web sites for the 2010 gubernatorial vote. Results are official for both years, although those from 2010 are subject to amendment. The struggle has engaged President Obama. He has criticized Walker's actions as an “assault” on unions. And he has activated his political arm, Organizing for America, to help mobilize turnout for the large rallies in Madison in recent days by the public employees. Walker, though, has refused to budge. Making the story even more compelling for 2012 is that both Obama and Walker have shown strength in Wisconsin among many of the same voters. To be sure, Obama's decisive victory in the state in the 2008 presidential race was fashioned in the urban centers of Milwaukee and Madison, while Walker's 2010 gubernatorial triumph was propelled by the usually massive GOP vote in the suburbs of Milwaukee. And exit polls from their respective races showed differences that one would expect to see between a Democratic and a Republican candidate. Obama, for instance, won the majority of votes cast by Wisconsin women; Walker did not. Union members in the state backed Obama by nearly 2-to-1. Voters in union households opposed Walker by a similar ratio. And predictably, nearly 90% of Tea Party supporters backed Walker's gubernatorial bid, a reflection of the reputation he had earned as a tax-cutting, budget slasher while serving as Milwaukee County executive. But exit polls from 2008 and 2010 also showed that Obama and Walker had major areas of overlapping appeal. Both won several large swing groups in the Wisconsin electorate – independents and Catholics, as well as white voters and men. The actual returns from both contests also showed considerable geographical similarity in their support. Of Wisconsin's 72 counties, both Obama and Walker swept 59 in their respective races – 46 of which were won by both candidates. Each carried most of rural Wisconsin as well as the bulk of longtime manufacturing centers, including the counties that include Green Bay, Racine, Kenosha, Manitowoc, and yes, Oshkosh. 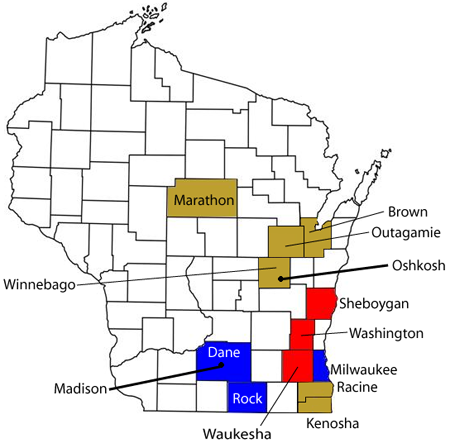 Which party wins these swing counties and constituency groups in 2012 – not only in Wisconsin, but also the whole swath of Rust Belt terrain “from Scranton to Oshkosh” - could be significantly affected by the outcome of the current Republican-labor showdown in Madison. Each of the parties have strong bases of support in Wisconsin - Democrats in Madison and Milwaukee, Republicans in the Milwaukee suburbs. But much of the state is swing territory that was carried by both Democrat Barack Obama in the 2008 presidential election and Republican Scott Walker in last year's gubernatorial contest. In fact, both Obama and Walker carried 59 of Wisconsin's 72 counties. 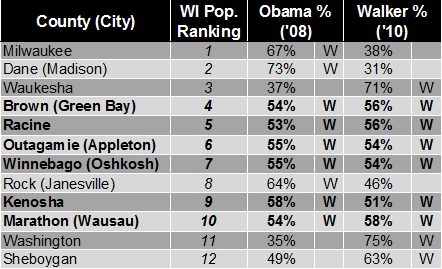 Below is a comparison of the Obama and Walker vote in Wisconsin's dozen most populous counties. There was considerable overlap in their vote-getting appeal. Note: On the map, counties won by both Obama in 2008 and the Democratic gubernatorial candidate (Tom Barrett) in 2010 are shaded blue. Counties won by McCain in 2008 and Republican Scott Walker in 2010 are shaded red. The remainder are "swing" counties, shaded gold. In the table, a "W" indicates the candidate carried the county. Those won by both Barack Obama in the 2008 presidential contest and Scott Walker in the 2010 gubernatorial election are indicated in BOLD type. Vote percentages are based on the total vote. The population ranking for these 12 counties is based on the 2000 census. Wisconsin data for 2010 is not available yet. Sources: America Votes 28 (CQ Press) for the 2008 Wisconsin presidential vote by county; the Wisconsin election web site for the 2010 gubernatorial vote by county. Results are official for both years, although those from 2010 are subject to amendment.